#LakeAtitlanHotels like Hotel Mikaso, Casa Atitlan (formerly Hostel Jarachik), Hostel Zoola and Maya Moon Lodge are some of the top hotels in Guatemala, thanks to their location on beautiful Lake Atitlan. Hotel Mikaso at Lake Atilan is the classiest hotel in San Pedro la Laguna. 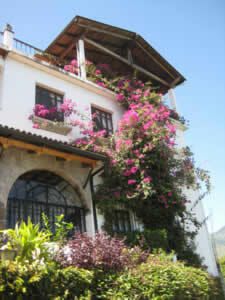 For more info on hotels and hostels at Atitlan, see Hotels at Lake Atitlan. Many hotels and hostels in San Pedro la Laguna are full today, so count on looking around town if arriving without a reservation. But don’t panic! There are lots of hostels in San Pedro. Guides who greet the shuttles will know which places have vacancies. The town’s top hotel is Hotel Mikaso, near the dock for boats to Santiago. Mikaso has views of the volcanoes and the lake, a great restaurant and is reasonably priced for such a nice place. The Colonial-style architecture gives it the feel of a Zorro film, and it is close to El Barrio Bar, The Blue Parrot Bar and Grill, and other bars along 7th Avenue. Midway between the Santiago and Panajachel docks, Hostel Zoola and Casa Atitlan are centrally located and convenient to all the restaurants, bars and schools in San Pedro La Laguna. Both have private rooms as well as dormitories. Zoola’s Bar Pool is the town’s only heated pool, with a close-up lake view and a big bar at the entrance overlooking the pool. Q25 entry includes first drink. Great restaurant too. Casa Atitlan, at the former site of Jarachik, has rooftop rooms have fine vistas, and the Cafe Atitlan restaurant has booths and covered tables in the garden. And the bar serves house drinks like Cuba Libres and Gin and Tonics for Q9. For more about lodging and rooms, see San Pedro la Laguna hotels. The classiest hotel in San Pedro is surprisingly affordable. And Hotel Mikaso has incredible vistas of Lake Atitlan and three volcanoes, with a Jacuzzi on the roof for even better view.Hotel Mikaso’s restaurant serves gourmet cuisine like Shrimp Tempura and Mayan Paella as well as burgers and sandwiches. Hotel Mikaso is also close to other restaurants and bars on Avenida Seven. Next to the dock for Santiago boats, it is near The Deep End Bar and Restaurants, where guests of Hotel Mikaso get special disounts. Read a feature review at Hotel Mikaso Or visit the hotel’s site at Hotel Mikason.